The full text of Brian Cowen’s speech this evening, where the Taoiseach stated his intention to remain as Fianna Fáíl leader. The following is the full text of Brian Cowen’s statement this evening, when he stated his intent to remain as Fianna Fáil leader and to table a motion of confidence in himself at a party meeting this week. Today I am announcing the outcome of the consultation with my Fianna Fáil Parliamentary Party colleagues, whose job it is to decide on the Leadership of this party. I want to thank each and every one of them for their consideration and commitment to this comprehensive process that I have undertaken. All discussions with all members have been cordial, mutually respectful and productive. I am again heartened by the strong commitment of all my colleagues and am proud to serve alongside them. The most important issue that I have had to consider is what is in the best interest of the country at this time? We are all aware of the immense challenges that this administration has faced in charting a way through some of the most difficult economic times since the foundation of the State. This party is founded on service to the country and has displayed its capacity along with the Green Party and working with independents to provide a working majority to implement difficult but necessary decisions to help chart our country through an international economic and financial crisis, the likes of which has not been seen in over 80 years. This Government, under my leadership, has followed a consistent path to help stabilise our economy in the aftermath of the biggest downturn in modern Irish economic history. Our budgetary strategy has helped to stabilise our economy, and return it to economic growth. This Government has obtained approval for its National Recovery Plan and provided for the proper funding of the State through the negotiation of an EU/IMF financial package. This will give us the time and space to continue on a path of adjustment that will restore economic growth and thereby create jobs. It will also allow us to continue bringing our public finances back to order while providing necessary public services for our people. That achievement, in the most difficult of circumstances, has been the result of the strong, cohesive, coherent and effective actions of the Government that I am privileged to lead, despite relentless opposition from other political parties, who have benefited from the fact that they don’t hold the responsibility of government. As Taoiseach, my total focus must remain on discharging my duties to the people so that we give legislative effect to the Budget through the enactment of the Finance Bill, and other related bills which benefit the people. There is nothing more important than doing precisely that. When that work is done and an election is called, I look forward to the opportunity to engaging in what must be a balanced and national political debate about the real choices that face our country given the situation we will continue to face in the years ahead. I look forward to that political challenge as an exercise of democratic political accountability by this Government to the people it serves. I am keenly aware that in putting the country first, and given the magnitude of decisions we have taken, necessary as they are, that this has impacted on the support levels of our party. I am emphasising again that this party, as with other parties, was founded as a vehicle to vindicate the aspirations of the Irish people and to ensure progress on their behalf. For Fianna Fail, the party is important but the interests of the country are paramount. In 2008, it was my great privilege to be elected leader of Fianna Fáil, the Republican Party. I have spent my entire adult life as a member of the Party and I am proud to have served Fianna Fáil at every level. I have an abiding commitment to and respect for the party, its history and traditions. I have a deep affection for the Fianna Fáil organisation and the men and women who give selflessly of their time in promoting our party and its efforts to build a better Ireland. I know that the membership of Fianna Fáil the length and breadth of Ireland are concerned about the party’s prospects at the next election. It is not surprising that those concerns are reflected in our Parliamentarty Party proceedings. Just as our work in Government has been about bringing clarity and direction to the economic and social life of our country, so also must there be clarity about the role and responsibilities of those who hold political office. The suggestion being made regarding a change of leadership in Fianna Fáíl while I continue as Taoiseach in order to complete the tasks I have already referred to, is not one with which I concur. I do not believe it to be in the country’s interests nor do I believe it to be in the settled collective view of my colleagues in the parliamentary party. Having one line of authority as a Taoiseach, and a separate line of authority in political decision making as a leader of Fianna Fail is not in my view, a good idea. It could lead to confusion and dilution of authority for the persons concerned. Given the electoral challenges we face, I believe it to be in the best traditions of Fianna Fáil to work collectively together defending and explaining the decisions we have made under the collective authority of Government. It behoves us all to display unity of purpose and to advocate our shared values by proposing policies that promote the common good as we seek support from the people at the next election. I respect and admire the strong conviction and sincerely held opinions in our party. May it ever be so. We are all motivated by the same goals. Having consulted with my party colleagues, and having reflected on the current and future challenges, I have come to the conclusion that it I should continue to lead the party. I believe this is in the best interest of stability of the government, the country and our party. Those who know me, know that I am not motivated by personal ambition. My decision is my deeply held belief having considered all issues and concerns brought to my attention in recent days. I believe that any issue regarding my leadership of Fianna Fail should be resolved immediately. I have therefore decided to place a motion of confidence in my leadership before next Tuesday’s parliamentary party meeting. The vote will be by secret ballot. By taking this initiative, I believe I am acting in the best interest of the party and its membership, and I am confident of the outcome. Once we have dispensed with this issue, we will unite behind whatever decision is taken and focus our attention on the work in hand at both party and government level. 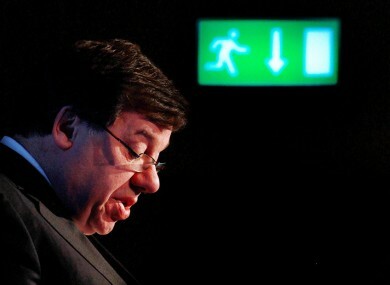 Email “Brian Cowen's leadership announcement: the statement in full”. Feedback on “Brian Cowen's leadership announcement: the statement in full”.